If you have read anything else or follow me on Twitter, then you already know this, but I want this one bad tonight. 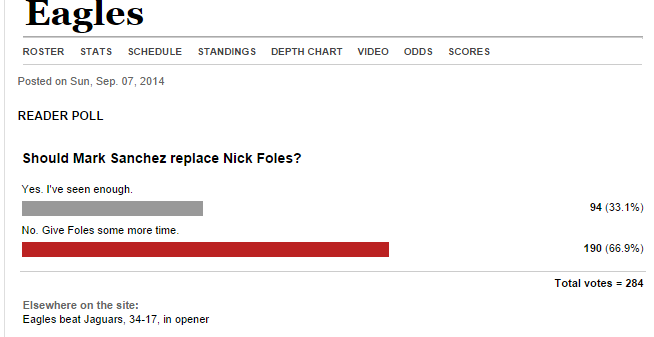 The Colts are my Super Bowl pick, and I really like Andrew Luck, but I want to see Nick Foles beat him head-to-head. Just like last week, I will roll out some numbers that I believe could key an Eagles road victory in Indianapolis tonight. Against the Jaguars, we only hit on two out of five numbers but were very close on two others. Around midnight tonight, we will go back and evaluate whether or not the goals were reached, so without further ado, let’s introduce them. Here are five Eagles numbers that I hope to see in the box score after the final whistle tonight. Less than 45 rushing yards for Trent Richardson — Richardson was fantastic at Alabama and had sky high potential coming out of college but has mostly been a bust so far. One way to solve Andrew Luck is to make the Colts offense one-dimensional. The Eagles run defense did a nice job against Toby Gerhart last week, limiting him to 42 yards on 18 carries, but I have seen them make average running backs look above average in the past. They are very capable of keeping Richardson in check, and doing so would grease the wheels for a win. No more than one turnover for Nick Foles — Between two fumbles and a red zone interception in the first half last week, Foles was responsible for three turnovers. I do not think the Eagles have to crush the turnover battle to win tonight, but losing it by two like they did against Jacksonville would be less than ideal. You got this, Nicky. Jeremy Maclin with 90+ receiving yards — Maclin had a great opener with four receptions for 97 yards, including a 68-yard go-ahead touchdown. Even the most cynical of Eagles fans had to be happy for him. Now, it is just a matter of turning in those performances consistently. There should be room to throw against the Colts defense, and two nice games in a row would be an awesome start to the season. At least 14 first half points — The Eagles do not have to come out firing completely on all cylinders, but they will not be able to survive another first half shutout tonight. If they win the coin toss, Chip Kelly normally likes to defer so they begin the third quarter with the ball after being afforded halftime adjustments. Fourteen points after the first 30 minutes should have them at the very least within striking distance. Andrew Luck sacked three or more times — The Colts offensive line is not known to be a particularly strong unit, and Luck was sacked by the Broncos three times in the opener. The Eagles got Chad Henne for three sacks in the opener last week, and a good amount of Billy Davis’ blitz packages seemed to be getting home. If Trent Cole, Brandon Graham, Vinny Curry, Mychal Kendricks, or someone else can put Luck on his back a few times, the Eagles chances of leaving Lucas Oil Stadium 0-2 will greatly increase. I wanted to put something in here about LeSean McCoy, but you just expect him to have good games at this point in his career, so it almost seems like a waste to highlight that. McCoy still managed to average 74 yards even with the offense sputtering last week, and I do not think it is out of the question for him to go over the century mark tonight even with no Evan Mathis along the offensive line. There you have it. This is what I will be looking for in about 14 hours: 45, one, 90, 14, three, and hopefully a nice 2-0 record along with sole possession of first place in the NFC East. This entry was posted in Uncategorized and tagged Alabama Football, Andrew Luck, Billy Davis, Brandon Graham, Chad Henne, Chip Kelly, Denver Broncos, Evan Mathis, Indianapolis Colts, Jeremy Maclin, Lucas Oil Stadium, Monday Night Football, Mychal Kendricks, NFC East, Nick Foles, Philadelphia Eagles, Super Bowl, Toby Gerhart, Trent Cole, Trent Richardson, Vinny Curry on September 15, 2014 by drewbalis. No, I’m not talking about fifth round pick Ed Reynolds. This blog post is inspired by a question that my dad would repeatedly ask last Eagles season every time Zach Ertz made a big catch. 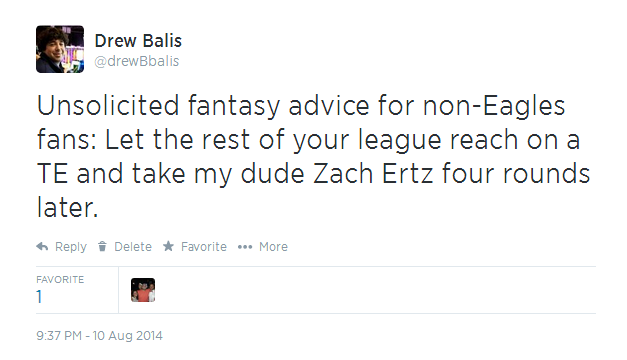 I am unsure if he ever learned the rookie tight end’s actual name. No worries, “the kid from Stanford” went on to have a very solid first season in midnight green, finishing his rookie campaign with 39 catches for 491 yards and five touchdowns (including a playoff game with three receptions for 22 yards and the go-ahead score with under five minutes remaining). Extrapolate the final eight games of the regular season over a full year, and the total would come out to 44 receptions for 536 yards and eight touchdowns. Early on last year, Chip Kelly and the Eagles coaching staff was hesitant to put Ertz on the field a ton because he needed to improve as a blocker and had struggled with some drops in the preseason. Kelly, rightfully so, still loves Brent Celek, who is going into his eighth season with the birds, but it is going to be impossible for him to keep Ertz off the field this year. Look for the offense to feature some more two-tight end sets and do whatever it takes to get Ertz on the field. I realize what I am telling you here isn’t exactly groundbreaking, but it’s exciting to have a young weapon who is on his way toward becoming a stud. This chart from Jimmy Kempski of Philly.com paints an even more complete picture. Sorted by yards, it compares the rookie seasons of some of the game’s current elite tight ends, and the only player to post better numbers than Ertz is Rob Gronkowski with the Patriots in 2010. In his final season at Stanford in 2012, Ertz posted a line of 69-898-6, and I foresee him doing something very similar to that this year, just add in a few more touchdowns. 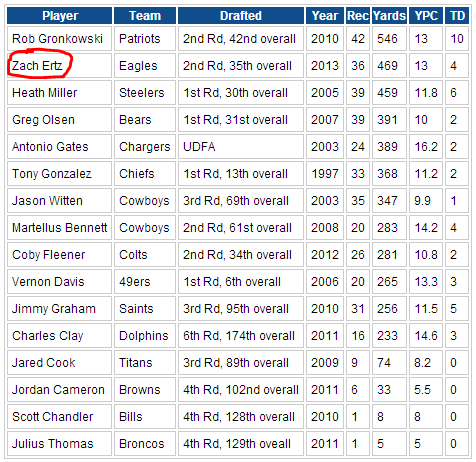 The only tight end in the league who is a lock to put up better numbers than Ertz is the Saints’ Jimmy Graham. Julius Thomas and Jordan Cameron will be hard to beat, but I would not at all be shocked if it happened, which brings me to this. I am fully expecting to hear “Is that the kid from Stanford who they got playing for em?” a ton over the next five and a half months. This entry was posted in Uncategorized and tagged Brent Celek, Chip Kelly, Cleveland Browns, Denver Broncos, Drew Balis, Ed Reynolds, Jimmy Graham, Jimmy Kempski, Jordan Cameron, Julius Thomas, New England Patriots, New Orleans Saints, NFL, Nick Foles, Oregon Football, Philadelphia Eagles, Philly.com, Rob Gronkowski, Stanford Football, Zach Ertz on August 21, 2014 by drewbalis.